This image of the Milky Way over Marshall Point Lighthouse was taken by Mike Taylor & Sonia MacNeil, the team at Taylor Photography from Marshall Point Lighthouse in Port Clyde, Maine. 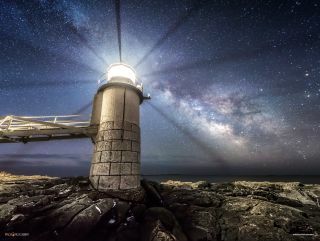 Shining like a beacon, this amazing lighthouse image appears to shine right at the Milky Way in the night sky. The image was taken by Mike Taylor & Sonia MacNeil, the team at Taylor Photography from Marshall Point Lighthouse in Port Clyde, Maine. Comet 252P/LINEAR can also be seen as a green spot above and slightly to the left of the galactic core. Comet LINEAR was discovered on April 7, 2000 , by researchers from the Lincoln Near Earth Asteroid Research program (an MIT Lincoln Laboratory program funded by NASA and the U.S. Air Force). The comet's core is estimated to be 750 feet (230 meters) across, according to the statement. In this behind the scenes image, Taylor photography highlights the process for creating the Milky Way from Marshall Point Lighthouse as well as their technical specifications. In the behind the scenes image below, Taylor photography highlights the process it takes to make the image shine as well as their technical specifications.